RELAWAN JANGKA PANJANG DIPERLUKAN secepatnya! Ingin Bekerja di Kalimantan? Ayo bergabung! “The friendship with children, local villagers, and the staff are what I enjoyed the most,” says Sachiko Maruyama (45) who recently spent six weeks living and volunteering with Friends of the National Parks Foundation (FNPF), on the island of Borneo in Kalimantan’s Tanjung Harapan village. Japanese volunteer Sachiko Maruyama (front left) with some of our Kalimantan staff and friends. “I love FNPF. I am planning to visit FNPF and Harapan village again,” says Sachiko, who comes from Japan. 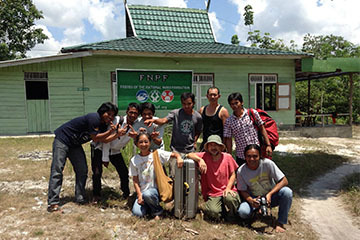 Tanjung Harapan village, also known as Sekonyer village, is on the border of Kalimantan’s Tanjung Puting National Park, and it is where FNPF, a frontline grassroots conservation NGO, runs an environmental education program. FNPF is involved in reforestation, community development and education, and the protection of endangered wildlife, including the critically endangered orangutan, at two projects sites in Kalimantan – Tanjung Puting, a UNESCO Biosphere Reserve, and Lamandau River Wildlife Reserve. When she saw her first wild orangutan on the Indonesian island of Sumatra, almost 15 years ago, Sachiko says it was one of those ‘aha’ moments. Since then she has been working to increase community awareness of the plight of these beautiful creatures. To help she has set up her own orangutan-focused NGO, F.C. Manis or Manis Fan Club. Manis means earth in Japanese. “When I saw the wild orangutan for the first time I was shocked, but grateful that they were near human. After that I published a book for children about orangutan. I would like everyone notice and love orangutan,” says Sachiko, who back home works as a designer. Her love of orangutans led to a trip to Tanjung Puting National Parks two years ago, when she visited Camp Leakey – the world’s oldest orangutan research and conservation center. Then this year, her second visit to the park brought her to Tanjung Harapan village and FNPF’s conservation programs. Along with volunteering with us she also ran her own environmental project, funded by the Japan International Cooperation Agency (JICA), during her six week stint in the tiny remote village. Sachiko got involved in many activities, some as a volunteer with us and some as part of her project. She taught environmental education to the village’s children, conducted orangutan research and a survey of villagers, inspected a palm oil planation, investigated ecotourism opportunities, and studied the type of tourists who visit the national park. Now back in Japan she is planning to explore ways to use the information she collected from her research to further help the orangutans of Kalimantan. We, at FNP, hope to see you back again in Kalimantan one day Sachiko. FNPF welcomes visits from volunteers and tourists, looking for life changing experiences, a chance to gain understanding of Indonesian communities, culture and spirituality, and also the opportunity to learn about the threats facing Indonesia’s amazing wildlife and habitat. Check out Volunteering in Kalimantan or email us at info@fnpf.org for more information. Our volunteers get the chance to work closely with our staff and communities, and join a program that will benefit local inhabitants, wildlife and their habitat. Our work in Kalimantan has been possible thanks to our donors, including the Humane Society International (Australia), who has supported us for more than 14 years, Boeing, Taronga Foundation, Buy One Give One, Save Indonesian Endangered Species, Eco Future Fund Japan, and many others.